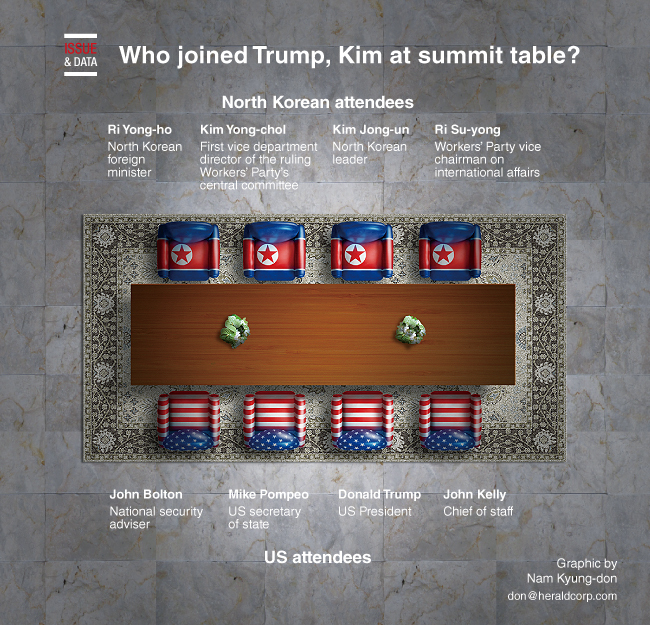 Who joined Trump, Kim at summit table? US President Donald Trump shakes hands with North Korea's leader Kim Jong Un before their expanded bilateral meeting at the Capella Hotel on Sentosa island in Singapore June 12, 2018. The first session of the summit between US President Donald Trump and North Korean leader Kim Jong-un was joined by only the two leaders’ respective translators, but they were joined by their aides at the expanded bilateral meeting. Trump was flanked by US Secretary of State Mike Pompeo, chief of staff John Kelly and national security adviser John Bolton, as previously announced by the White House.